My work is an intuitive response to nature, in particular the central Australian desert where I have lived since 1992. I work organically, activating the essence of what it feels like to be in the landscape. I deconstruct and anthropomorphize the landscape and challenge the human-centered viewpoint of nature. Restorative care and reparative action are the points of reference embodied in my environmental work. Through layering of textured mark making I create the subtle irregularities and patterns of a world where nature is the major stakeholder. The tension between the interdependent line work and form creates the counterpoint for the structure and colour in my paintings. I am creating spacial harmony: a place of reprieve and refuge, as nature does in life. A fundamental aspect of my work is my response to the brilliant glare of the central Australian light and its effect on land formations. My practice is painting; acrylic paint and oxides on linen or handmade recycled Indian rag paper. 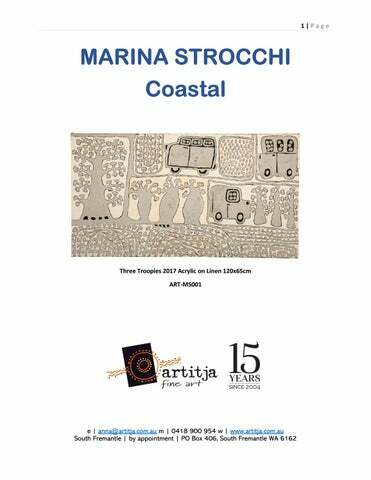 This curated body of work for Artitja celebrates life at home and holidays at the coast with a reference to being ‘out bush’ in Three Troopies. Living in a land locked desert with months of searing temperatures one’s mind drifts to the ocean visits and the familiar shape of boats bobbing in the water, which are also a part of the Northern Territory and its coast. The ‘musical’ paintings are a nod to our Sunday afternoon Klezmer rehearsals here in Alice Springs. The glare of the desert life is still with these works as is the palette. The environment in Central Australia has a powerful bearing over my work – it has not been cowered by extensive development as the landscape has been on the coast. This tiny settlement in the middle of vast deserts has a tenuous relationship to the land. 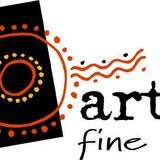 I have maintained a social practice with aboriginal artists through the central desert tri-state region (Western and Southern Australia and the Northern Territory). By invitation of the communities I facilitate painting and drawing workshops, which has allowed me a close relationship to Australia’s first nations people and their homelands. Through initiatives such as establishing the Ikuntji Art Centre in 1992, publishing a bilingual book on art from Ikuntji at Haast’s Bluff and ongoing workshops I have assisted in creating a forum for painting as a purposeful tool for Aboriginal artists to process the lasting repercussions of the trauma of colonialism.